Time = Money. In the GRE world, TIME SAVED = HIGHER SCORE. How long do you spend on a GRE quantitative question? Less than a minute? Absolutely Yes. Read on for all our GRE Quant Shortcuts. When it came to exams, even Albert Einstein got the jitters. A lot of successful candidates tend to be very particular about time. Time management is a very important skill that one should develop whether a home-maker, a parent, a student or a working profession. All you should be bothered about is how to manage your GRE exam time. There are twenty four hours in a day but some of that should be allotted to sleeping. Your brain cells need enough rest for rejuvenation. GRE quantitative score is calculated in a scale of 130–170 , in one-point increments. 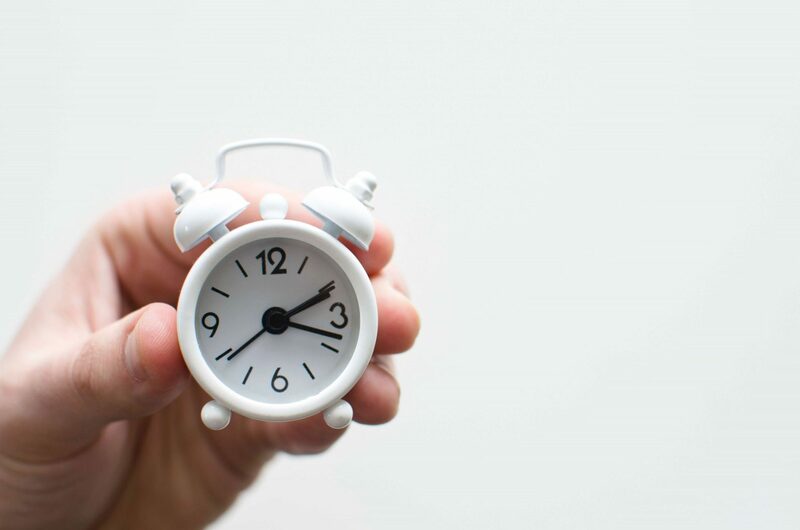 In this blog post, we want to share with you GRE tips to manage time during your preparation and on the day of the exam when actually tackling quant questions. Now, before you start with your preparation, fix a tentative date on which to take the exam and have a target score in mind. That score should be based on which universities you’re planning to apply to, what discipline you’re planning to pursue whether it’s an MS or a PhD. For example Computer Science – if you want to go ahead with an MS in Computer Science , a 170 is required by most universities. To get into an Ivy League or a good university, it’d help greatly if you had a high GRE Quantitative score. Of course, there are courses that don’t expect so high a score in the GRE Math but at Galvanize we work very hard to make sure that every student reaches that perfect score. So, what is the first step in this journey towards your target score? It’s having a comprehensive study plan.What do we mean by a study plan? It’s a chart that you’re going to make. Whether on a daily or an hourly basis, you should plan to squeeze in an appropriate amount of time for your GRE Quantitative Reasoning practice amidst other commitments. If you’re a working professional, you might have to find some time within your work hours or after your work hours to prepare for the GRE. You also need to keep the target date in mind – so how much time you should allot depends on the target day and how much you need to cover. 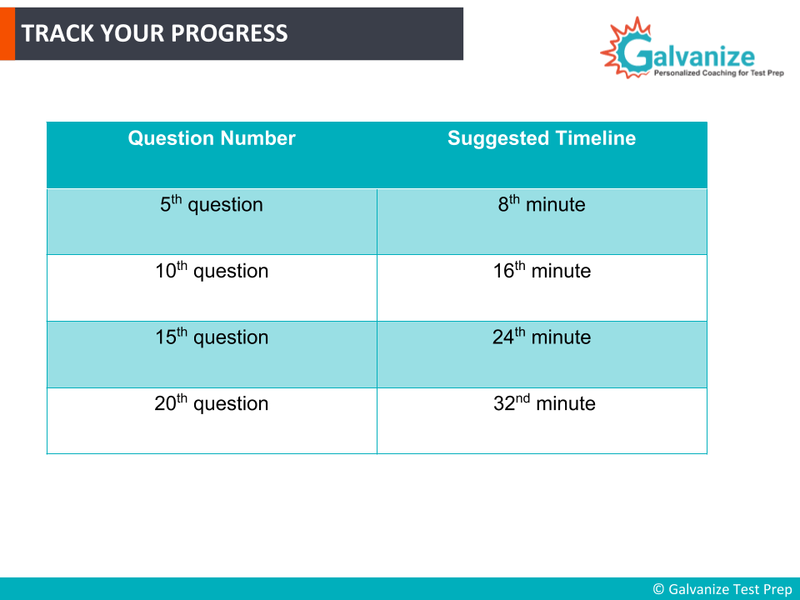 At Galvanize, we give every student a comprehensive study plan based on their diagnostic test score & their target date keeping in mind other personal commitments. We make sure that our study plan is comprehensive, exhaustive and convenient allowing you to attain your target score easily. You only have to follow the instructions of your course managers and the study plan – that’s all you need to do if you enroll at Galvanize. 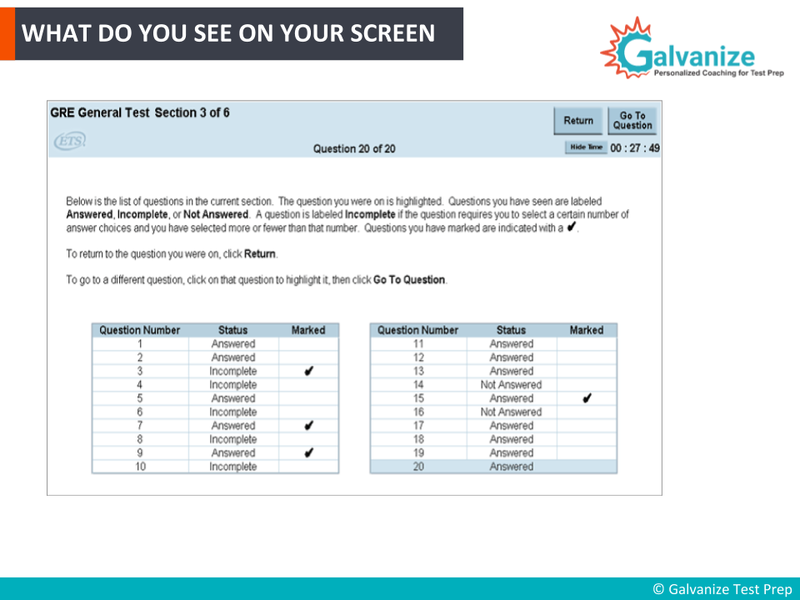 Quant section has 40 questions in total which are divided into 2 sections each containing 20 questions and the time for each section will be 35 minutes. On a total the GRE Quantitative sections takes 1 hour 10 minutes. This section includes four main topics. ETS tests the following skills with quant section. Understanding elementary mathematical concepts and skills. So let’s see what subtopics are present in this sections. To tackle this section you need to have a better understanding on number family and operations performed on them. Since basic algebra focuses on simplifying and manipulations of equations you need to practice by taking up simple problems followed by difficult one’s. Memorize basic Geometric formulas for easy calculation and saving time. This section needs more attention as it may have more data to be considered while solving the problems. Practice a lot and take the quantitative tests to score well. Now, a lot of students ask which topics should be prioritized in the GRE quant syllabus. Knowing which topics to prioritize is very important for an exam like the GRE. It will ensure you channel whatever time you have available towards having the most effective GRE Quant practice sessions. First things first, thus far, Geometry has been found to carry less weight. There are usually only two or three questions asked – these questions tend to be quite difficult though. Most weight is carried by Arithmetic and Data analysis. Data analysis carries the maximum weight. You have probability, permutations and combinations, data interpretation then arithmetic. Algebra is intertwined with arithmetic. So these three topics carry more weight than Geometry. So when you prioritize, you prioritize those topics you’re least comfortable with – for example that’s probably Data Analysis. GRE is a skill based exam rather than a knowledge based exam and this means concept clarity is a must. The questions you encounter will be very easy provided you’re very clear with the concept. If you’re going to prepare on your own, schedule a study plan, make sure you start with Data Analysis and Arithmetic and then you move on to Geometry in the end. You ought to make time to test yourself extensively across each of the topics. Allot time for your tests. Now, some of you might wonder ‘but is the GRE Math hard’? While it is true that compared to other standardized tests such as the SAT and the ACT, the GRE is considered more difficult, that’s no reason to panic just yet. The math tested on the GRE is actually of a lower level than the math tested on the ACT & SAT. The only reason the GRE might create more panic is that the word-problems consist of the most trickier vocabulary or the mathematics problems might require higher-level reasoning. It helps to remember that the GRE tests you on the most fundamental topics. No higher level math, no trigonometry, no calculus none of the topics that normally creates panic. Simple fractions, simple decimals, simple number theories, prime numbers, even numbers – these are the GRE Quant questions you’re likely to encounter. The main skill you need to pick up is time management. The GRE is a timed test, after all. It’s not enough that you allot time to brushing up on topics, you should also practice what you’ve learned. You should also be able to apply whatever you have learned and that is where tests come into play . You need to understand the pattern of the test at GRE. So we at Galvanize have a pedagogy here. After every chapter we have practice tests, untimed tests, timed tests, there are section tests across sections several mock tests to emulate the current GRE and all of our students have benefited from all these tests to the extent that their actual GRE score is almost always equivalent to our final mock test, the last mock test. 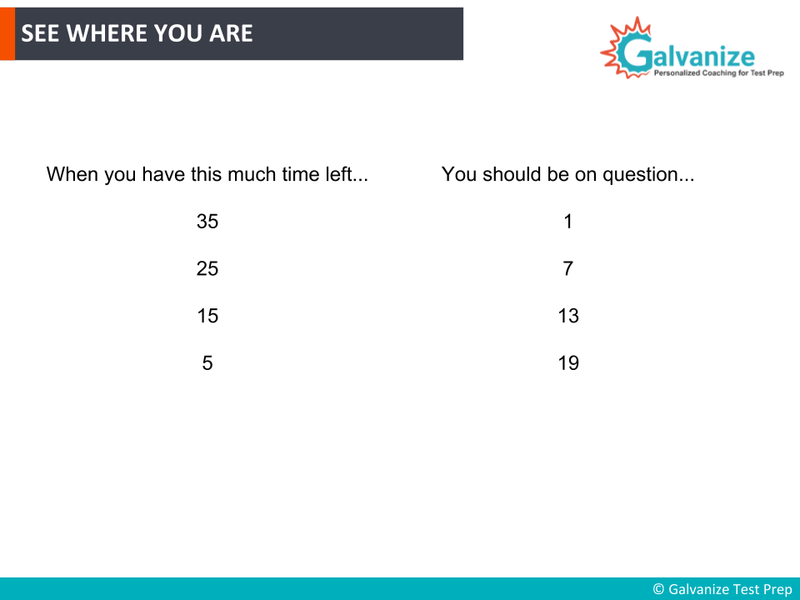 So, if you enroll at Galvanize that’s a huge advantage for you. You know that if you get a Quantitative score of 165 in the last mock test on our platform, then you’re bound to get a plus or minus 2 on the actual GRE. Almost an actual 165 is guaranteed in your GRE. That’s how our mock tests have been devised. As Confucius said “I hear I forget, I do I remember, I work hard and I practice, I understand”. So you need to practice really hard to make sure you comprehend the topics in mathematics and then understand the applications of these concepts. Simply taking tests is not enough, you should make time to review your mistakes. At Galvanize, after every test we allocated time to review students’ performances. This is very important. There is no point in moving ahead with tests blindly without reviewing each of the tests. GRE Practice Questions at your fingertips! Prepare a math cheat sheet to go through. Cheat-sheet here refers to a sheet of GRE formulas. This will come in very handy during your GRE Quant practice. As you know there are applications for quant formulas like surface area and volumes. Most questions require taking a rational approach. It will be easier if you memorize the formulas. Maintain a handbook of GRE formulas. 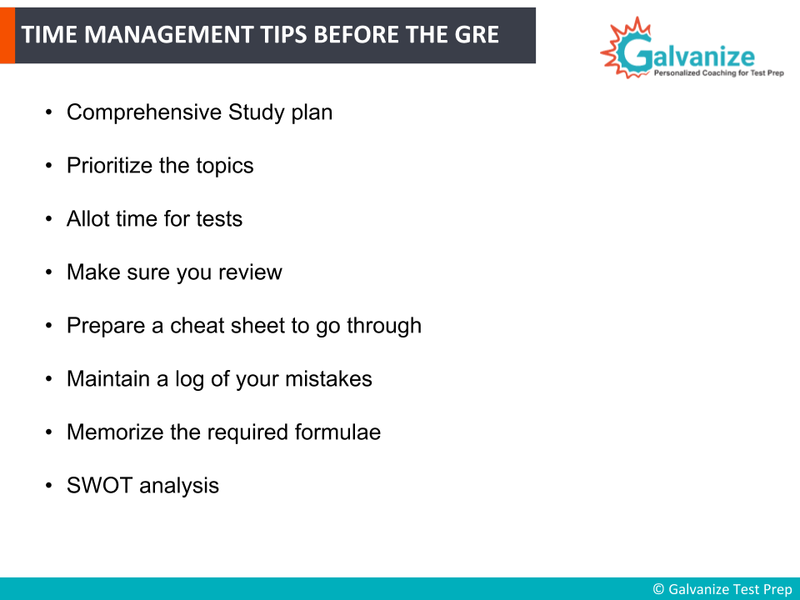 At Galvanize, we give students a PDF with all the important GRE Math formulas, rules, tips and tricks & strategies once you kick-start your study plan. 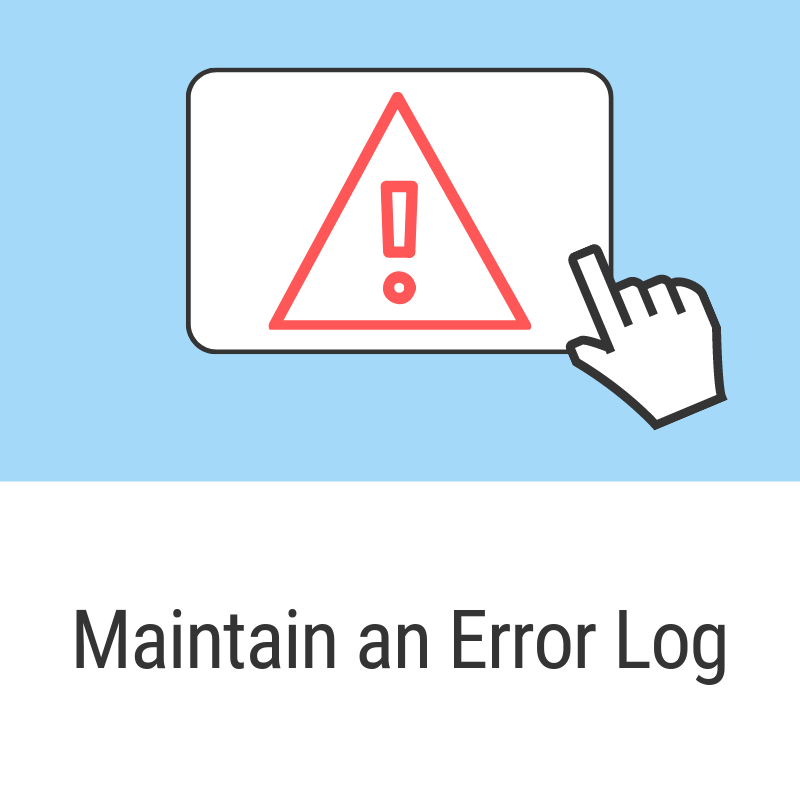 Maintain a log of your mistakes. It’s not wrong to make mistakes, what’s wrong is making same mistakes again and again. This way, you will never learn. Log your mistakes so that they don’t get repeated. Taking the time to review your GRE Math performance at the end of every test will result in greater confidence. At Galvanize, after every mock test we give our students personalized feedback logging a list of mistakes that you have made. We do this to help you understand where you’ve gone wrong. Now, that is where SWOT Analysis comes into the picture. We analyze your pain-points, strengths and weaknesses and give you topics you need to work on to improve your GRE score. GRE is a section adaptive test. Based on your performance on the first section, the difficulty level of the second GRE Quantitative Reasoning section will either increase or decrease. ETS intends to be more user friendly and adaptive this way. What should you do on the test day? You’ve prepped well, followed the study plan and reached this point. 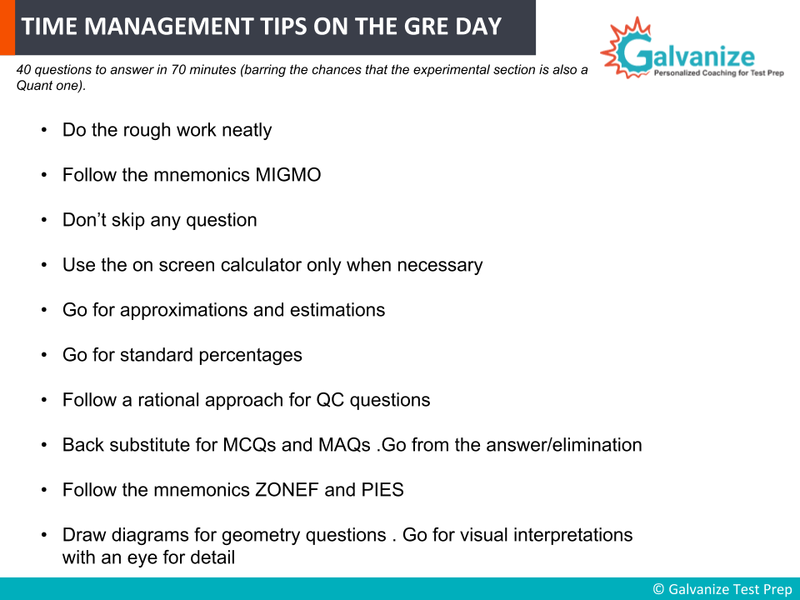 Here are a few Time Management Tips for the day of the GRE. First thing, you will be given a scratch paper. Do maintain the scratch paper neatly. Do the rough work neatly. It’ll be easier for you to analyze your work once you do your rough work neatly. Follow the mnemonics. MIGMO. MIGMO stands for Make an Intelligent Guess and Move On. GRE is a timed test with no negative marking. So, it’s not advisable to skip any question on the GRE. Skipping questions does not add any value to your score! Take a guess, it might go right and that will add value to your score! Use the on-screen calculator only when necessary. 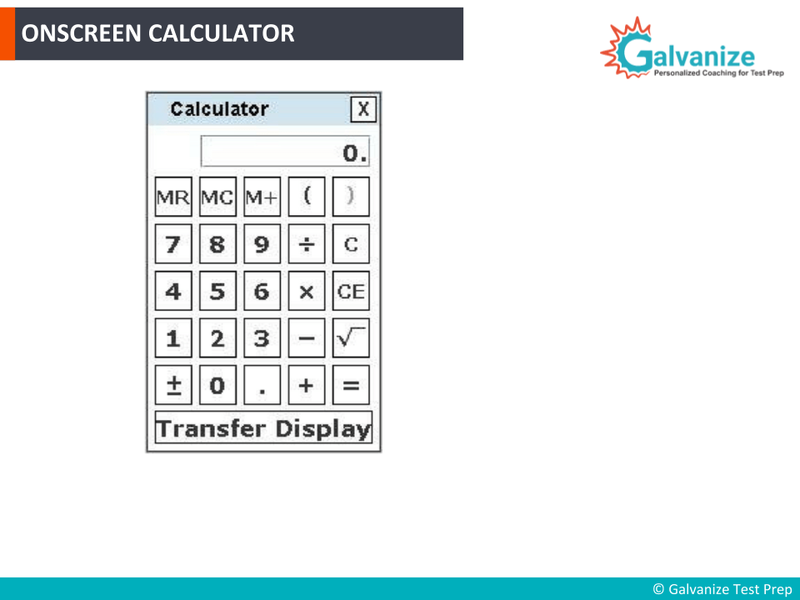 As we progress, we’ll explain what an on-screen calculator is and what it looks like. Go for approximations and estimations. This is very important, especially for a timed test like the GRE. Use estimations & shortcut techniques rather than long approaches to solve problems. Go for standard percentages. 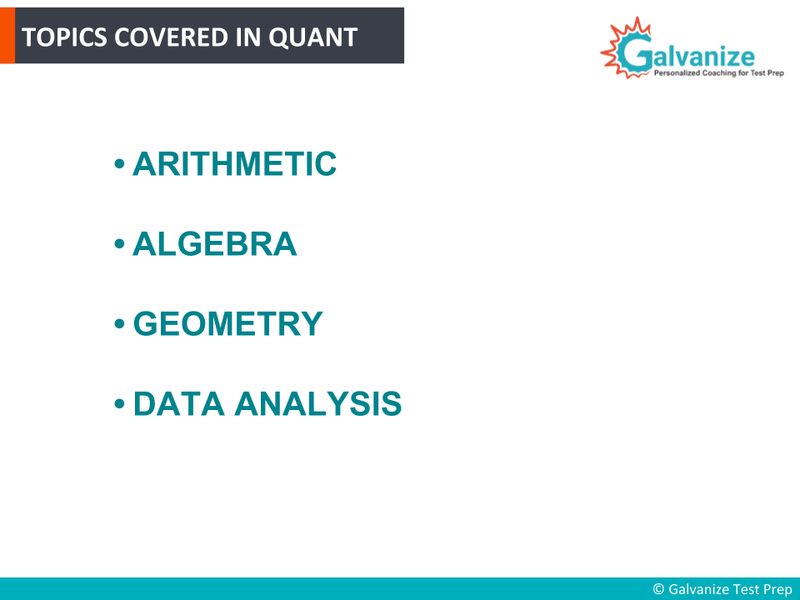 For Galvanize students, we have an exclusive module for Tips and Tricks to score a 170 in Quant. We have exclusive webinar videos on each topic and how you could solve them using tried-and-tested hacks. Oh, we nearly forgot to mention, all our webinar videos are also on YouTube for you to access! Follow a rational approach for solving QC type questions. You should not take more than 1.5 mins to solve these GRE Math questions. Back substitute for MCQs and MAQs. Go for the answer elimination method, do not use the analytical approach. Follow the mnemonics ZONEF and PIES. ZONEF is when you want to plug-in values. For example, if X is a positive number, then it can be a fraction or an integer. So ZONEF – Zero Once Negatives Extremes and Fractions comes into play here. More on this later in the blog. PIES is for word problems. Parts Information Equation Solving. Go for visual interpretation when dealing with Geometry question types . Go for textual information when dealing with word problems. You have two quantities – Quantity A and Quantity B. This is a multiple choice question with the 4 options fixed. A will be Quantity A being greater, B will be Quantity B is greater, third option will be both Quantity A and B being equal and fourth option will always be relationship cannot be determined. Go for the fourth option only after you analyze the GRE Math question in detail, reviewing the rest of the options and confirming that they do not fit. 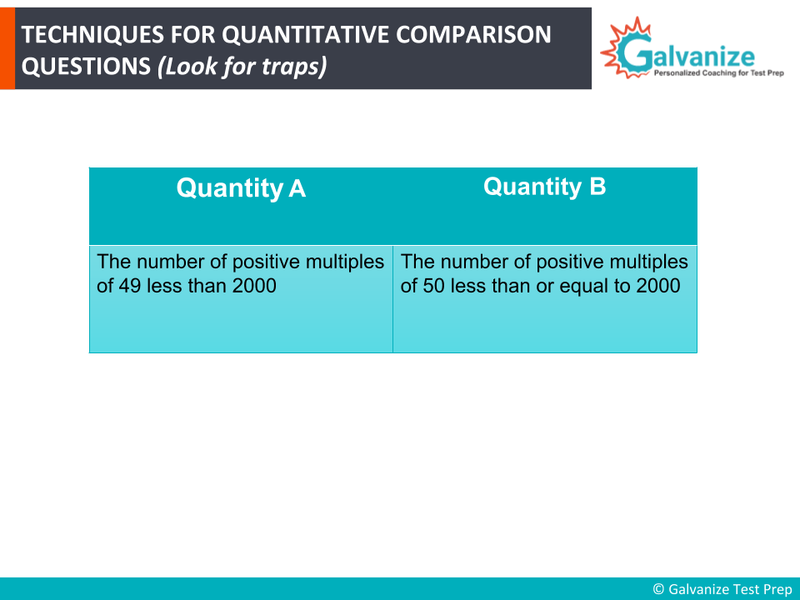 There is an exclusive webinar video on how to solve quantitative comparison question types under one roof – YouTube. Let’s understand the trap in this question. What do students do? Let’s take a look at the question below. They realize 49 is less than 50, so they say Quantity B is greater. The trap here is LESS than and LESS than or EQUAL to on Quantity A and B. So, you know Quantity A should be 40. Now, you see the answer is C, both the Quantities are equal. Do watch the video to understand the example further! To solve the question below, we’re going to do a little manipulation here. You know that the cube root of 8 is nothing but 2. 8 ^ ⅓ is 2. But you also know that when the powers are the same you need compare only the bases – 9^1/3 is greater than 8^⅓. Therefore, 9^⅓ is greater than 2. Let’s rewrite this- ‘x’ is actually ‘3-minus’ a number greater than 2, right? so you’re reducing by 3 here – a positive number. At the first step itself you know they’re subtracting ‘3’, so you know that the answer can’t be greater than 3. So option ‘E’ is ruled out. Again, we can see that “3 minus number>2” means that this value cannot lie between 1-2 or 2-3. This value, the whole value has to be less than one. So it cannot be between 1-2 , or 2-3. So these options are ruled out right now. On to the next one – 9^⅕ compared to 1^⅕. As we just covered, when the powers are the same, you need compare only the bases, so 9^⅕ is obviously greater than 1^⅕. So now you have “[3- (a number greater than) 2 + a number greater than 1]”. Now, 3- (a number greater than 2 + a number greater than 1) will give you a number greater than 3. This gives you the correct answer – it has to be a negative number, less than zero. This is how you will use the approximation techniques in such types of problems. Now on to elimination techniques – used mostly for Multiple Choice Questions (MCQ) and Multiple Answer Questions (MAQ). So five friends, two people – in probability questions, it’s always easier to find a denominator. The total number of ways you can select 2 people from 5 people is 5C2. So the denominator is 10 here. 5C2 is 10. So now we can eliminate option ‘C’ here. We’re left with four other options. I eliminated 0.25 directly because the denominator is 10 (5C2. ) so we can eliminate that option straight off the bat. So, now on to use of standard percentages. There is no competitive exam without atleast one question on percentages. Data Interpretation questions mostly will have applications of percentages or fractions & decimals only- nothing more than that will be tested. Right, so how do you use these standard percentages? 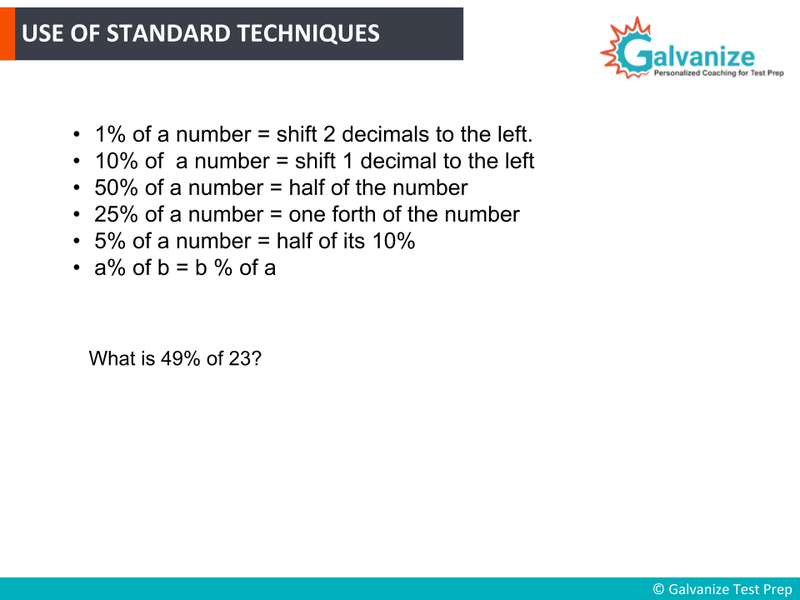 There are these standard percentages – when we’re talking about 1% of a number, shift 2 decimals to the left. It’s like 1% of 23 – you know that means 23 by 100 which is actually 0.23. All we needed to do was shift this decimal point two places to the left. Again 10% of the number, ship one decimal place to the left. 23/10 – that becomes 2.3. The decimal point is shifted one place to the left. 50% of any number is half of that number. 50% of 23 is nothing but half of 23 which is 11.5. 25% of a number is a quarter of that number. So 25% of 23 is 1/4th of 23. 5% of a number is half of its 10% so just find 10% of the number and then divide by 2. Now a% of b is the same as b% of a. So 23% of 50 is the same as 50% of 23. So if you have to find 23% of 50, don’t waste time calculating that. Find 50% of 23 which is 11.5 and that’s your answer. Practice GRE Math. Get Performance Insights and Review Explanations. Here’s an example. What is 49% of 23? Any of these standard percentages rules can be used to solve this. What we’re going to do is, we’re going to rewrite it as (50% of 23 – 1% of 23). 50% of 23 is 11.5 and 1% of 23 is 0.23. So the answer is 11.27. Instead of calculating 49/100 * 23, we’ve used a shortcut here. We’ve rewritten this in terms of the standard percentages. That gives us 11.27 which is what the answer is here. About the onscreen calculator – the GRE does allow you to use an onscreen calculator. However, not many GRE Quantitative questions – in fact, at most one question will involve tedious calculations. Mostly we tell students not to use this calculator. It will take time for you to open the calculator & plug in the answer choices. Now when you do have the onscreen calculator open, you should remember the important mnemonic – PEMDAS. This stands for Parentheses, Exponents, Multiplication, Division, Addition, Subtraction. You have to plug in the expressions only in this order- otherwise your answer will be wrong. So you can see now – this is what the onscreen calculator looks like. It’s not a scientific calculator. At the most, you can find the square root of the number – that’s all that’s given to you, right? So tedious calculations will not be a part of the GRE. The ETS tests you only on concept clarity – how well you have understood and can apply the concepts you’ve learned. So nobody’s going to give you a 5 digit number and ask you to multiply it by another 5 digit number. As much as possible, do not use an on-screen calculator. Now you have a ‘mark & review feature’ on the GRE General test. You can always mark any question that you don’t know to come back to later. You should not skip any question. You can come back and answer it when you have the time. As we’ve said, you should never skip any question on the GRE. Mark the questions you haven’t answered in a section as ‘incomplete’, if needed. Now, there’s a the visual element that you need to be watching out for – the time display you’ll see on your screens. Be very careful as to how you spread out the time. Right so, the first kind of question is Data Interpretation. There will be at most six questions and on average we expect students to spend no more than 2-3 minutes on a question on the GRE. So make sure you allot a full three minutes on average for data interpretation. 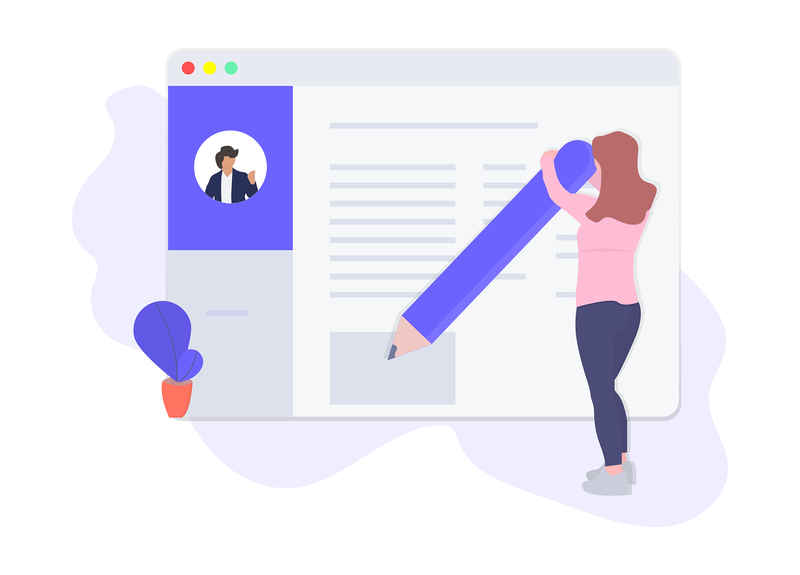 The reason we recommend this is it usually involves a simple graph but looking at that means you have to do it very carefully – look up at the units, look up all over the graph. There will be information all over the graph. Again there is an exclusive webinar on how to handle Data Interpretation questions on our Youtube channel – you can look at it to find out GRE Quant shortcuts & techniques. Now for numeric entry questions – there will be 2 or 3 questions and you will have to allot about 2.5 minutes per question. The reason being that numerical entry might involve an analytical approach. You will have to fill in the answer, there are no options. It might be a fraction, it might be a decimal. Next, MCQs. 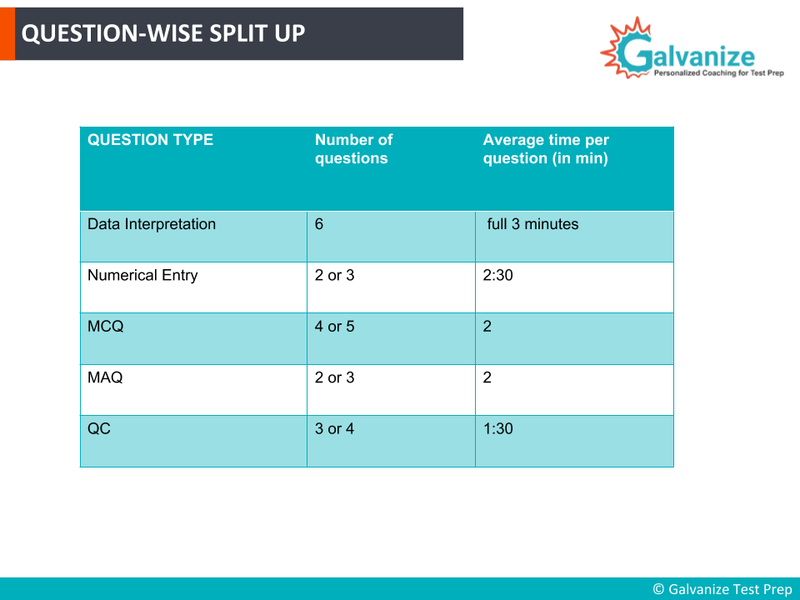 There will be 2 and you should not take more than 2 minutes per question. This should not involve an analytical approach, use back-substitution to get to the answer. 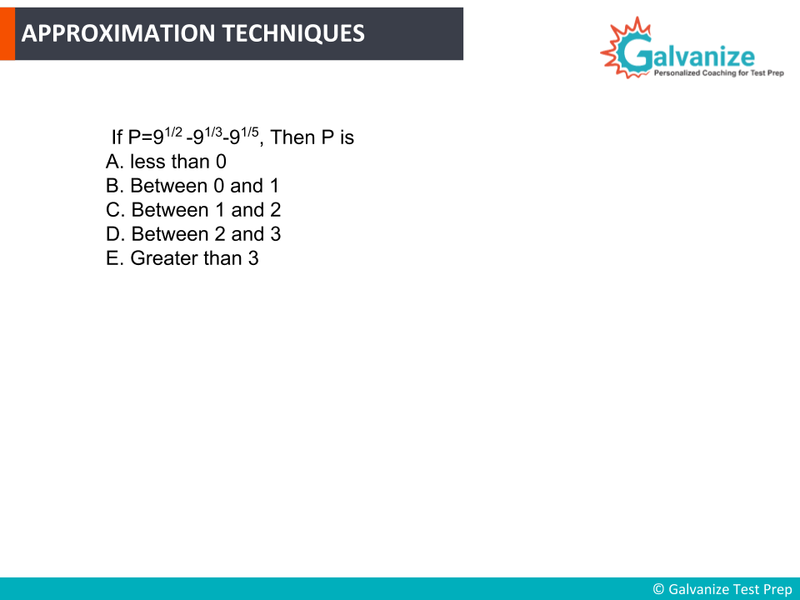 There are five options so use the elimination method to arrive at the right answer. The same approach needs to be taken with the MAQ questions- the MAQ questions are often considered the hardest. The reason being that if you don’t pick all the right options, you will not be graded for that question. So, if out of five options, three are correct, you need to pick all three. An incomplete answer is not graded so you will lose points on that. Quantitative comparison questions – as I just gave you an example, will involve you taking a rational approach. For each question, you can afford to allot 1.5 minutes. However, it shouldn’t take you that long to answer it. It shouldn’t take you more than 1 minute per question. You need to spread up your thirty five minutes in an efficient manner so that it’ll be easier for you to review what you have done before submitting it and then make sure that you have not made any mistakes. You could always look at your scratch paper to make sure you have made no mistakes. You will have time for that also provided you follow these timings properly, stick to these timings properly. 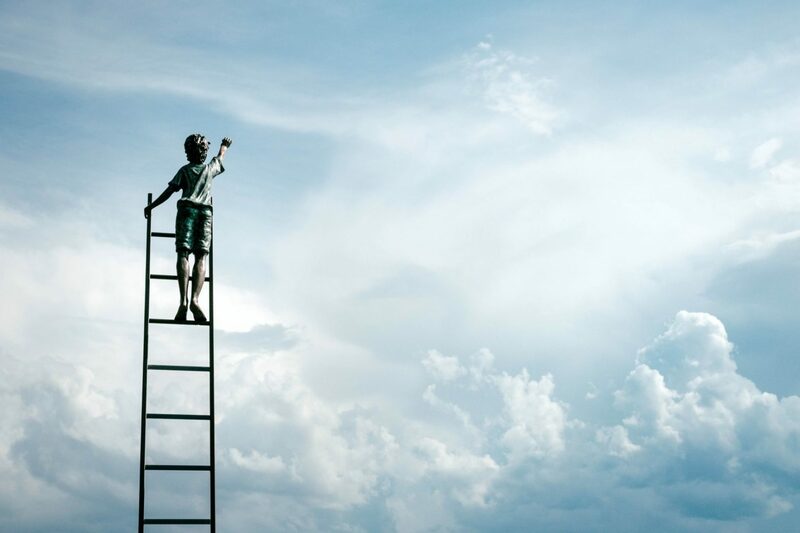 Right, now see where you are – this is the progress of where you should be. At the 35th minute is when you start the test – you should be on the first question. Twenty five minutes, you have just have completed ten minutes of your time which means you should have completed at last six questions. So you should be on the 7th question at the 25th minute. At fifteen minutes, you just have a few minutes left. Janssen's score increased by 25 points. See what he has to say! That is you should have covered most of the questions – you should be on the thirteen question.When you have just five minutes left, you should be on the nineteenth question. The reason is you might have skipped some questions or you might have marked them for later review, so if you are we have this five minute slot here you can always go back and attempt those questions. Apart from the mock tests, taking separate GRE quantitative practice tests are also an important contributor to success. So this is how you need to spread all the time on the day of the exam by best utilising these GRE quant tricks. Having said that what is most important is attempting every question, preparing properly. All the more important is having a good night sleep, eating good, healthy food, and making sure that you don’t panic during the exam. Stay cool, stay calm. This comes with taking more GRE online practice tests, more timed tests until you’re comfortable with the pattern of the exam. That is what we have on our platform. What is the remainder when (53)^35 is divided by 13? This question is a little tricky. Also try to give an explanation for your answer. How many three digit numbers can be formed using all the digits other than 0, not repeating any digit, such that the sum of the digits is 18? Which of today’s GRE Quant shortcuts are you going to try first? Are you going to work on your GRE Quant strategies right away? Or maybe you’re ready to start taking a few quantitative tests. [The Definitive Guide] Crack the GRE Reading Comprehension now! [GRE Math] Time Management Tips for a 320+ score!